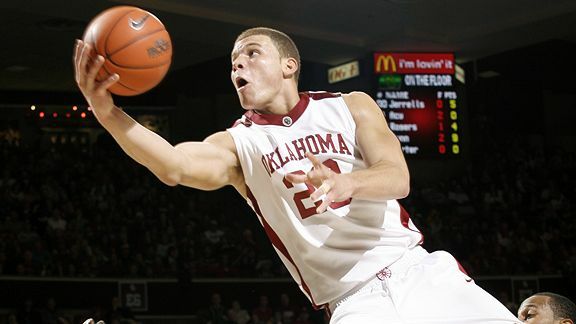 The University of Oklahoma Athletics Department received welcome news Friday when former OU men's basketball standout Blake Griffin committed to the largest gift ever to the University of Oklahoma by a former Sooner basketball player toward the High Performance Center Addition project at Lloyd Noble Center. The approximately 16,000-gross-square-foot addition will be constructed south of the men's and women's basketball's two existing practice facilities, and will help enhance strength training facilities for both programs, as well other Sooner student-athletes. "I'm really happy to do this," said Griffin, who was the 2009 consensus national player of the year and the No. 1 pick in the 2009 NBA Draft, and is a five-time NBA All-Star with the Los Angeles Clippers. "This is a special project and one my family and I wanted to significantly be a part of. I grew so much as a person and as a basketball player at OU. The High Performance Center will help our current and future players realize their collegiate potential while they're Sooners. Additionally, I look forward to utilizing the state-of-art center when I'm in Norman. "I'm truly excited about the future of our men's basketball program under Coach (Lon) Kruger and I want us to capitalize on the momentum of last year's run to another Final Four. And with a facility like this, I don't think it will be long before Coach (Sherri) Coale is making her fourth Final Four trip with the women's program, too." The OU Board of Regents approved new design modifications for the High Performance Center Addition project in June. The initial project was approved in May 2015. The main modification to the future facility merges both the strength and performance assessment centers into one structure. Added enhancements also include a nutrition center, indoor and outdoor turfs, as well as a multi-purpose space designed for performance testing and assessment. The estimated total cost of the project is $7 million. Griffin, who became Oklahoma's first winner of the Naismith Award, Wooden Award and Oscar Robertson Trophy, ranks first at OU in career field goal percentage (.618), second in rebounds per game (11.8), third in double-doubles (40), sixth in points per game (18.8), ninth in rebounds (805) and 18th in points (1,278) despite playing just two seasons. "The Griffins are a remarkable family and we are so grateful they are part of the Oklahoma Basketball family," said OU Vice President and Director of Athletics Joe Castiglione. "Wearing No. 23, Blake was one of the most electrifying players collegiate basketball has ever seen — a true generational type talent. The impact he made on our men's basketball program is enormous and felt daily. We're very appreciative that his generosity will now assist in the physical development of so many current and future OU student-athletes. Blake's example of dedication, hard work, and generosity builds upon his lasting legacy that everyone can admire." Griffin led the Sooners to the 2009 Elite Eight, averaging 28.5 points, 15.0 rebounds and 2.3 assists in four NCAA Tournament games. He averaged 22.7 points, 14.4 boards and 2.3 assists per game overall that season as OU climbed to No. 2 in the rankings after starting 25-1. It finished 30-6 and ranked No. 7 in both major polls. In six campaigns with the Clippers, Griffin owns career averages of 21.5 points, 9.6 rebounds and 4.0 assists per game while shooting .521 from the field. He was named NBA Rookie of the Year in 2011. Griffin, who had his No. 23 honored by OU on March 1, will be in attendance at Saturday's Legends Alumni Game that will tip off at noon. Lloyd Noble Center's east doors will open at 11 a.m., and admission is free. To explore options on how to contribute to the High Performance Center Addition project at Lloyd Noble Center, contact the Sooner Club at 405-325-8000.